The city’s Santa Rita Water Reclamation Facility is taking shape along Camino del Rio. The aeration basins on the right started functioning in June and have improved the quality of water released into the Animas River, according to a city official. The quality of the water flowing into the Animas River from the wastewater-treatment plant in Santa Rita Park has improved this summer, a shift required by the state that can prevent harmful algae blooms. The $55 million plant, the largest project in city history, is also running on time and is within the city’s budget, which included money for unexpected costs, City Engineer Gregg Boysen said. “We are at 62 percent completion. Although none of the structures can be considered complete, we have new buildings, equipment and infrastructure functioning throughout the project,” he said. One of the largest milestones of the project was reached this summer when the city started using new, large aeration basins to process waste with microorganisms. The basins immediately reduced the levels of naturally occurring nutrients, such as phosphorus and nitrogen that the plant releases into the river. “The nutrient removal has exceeded our expectations,” he said. 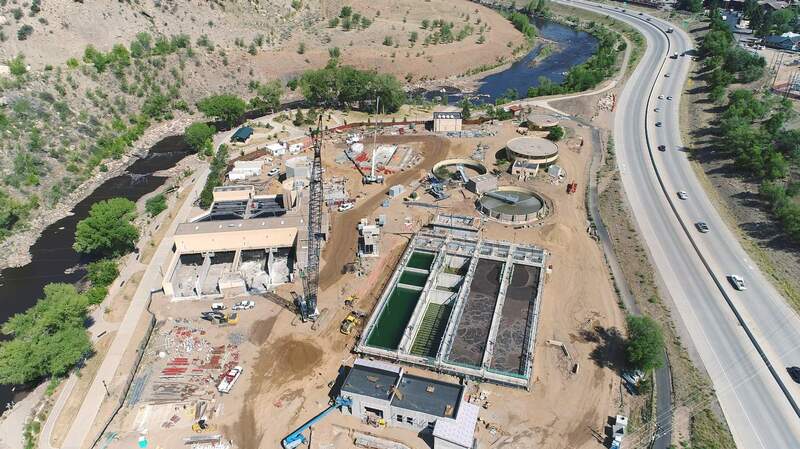 The state health department’s changing water-quality requirements around nutrients were a major reason the city of Durango needed to build the facility. At heightened levels, the nutrients contribute to algal blooms that reduce oxygen in the water and kill fish, according to the Environmental Protection Agency. The city expects to be able to meet the new state water-quality requirements when the Colorado Department of Public Health and Environment issues the plant a new permit, Boysen said. In addition to improving water quality, the construction will increase the plant’s capacity from 3 million gallons a day to 3.4 million and control the plant’s odor. The plant is expected to cost $55.1 million, of which the city has spent $33.9 million so far, Boysen said. The $55.1 million includes $1.15 million of the $5.2 million in contingency money the city set aside for unexpected costs. City staff requested most of the construction changes that led to the additional spending, according to a city presentation. To pay off the debt, residents saw three years of double-digit sewer rate increases. In January, rates went up 3 percent, bringing the average city residents’ monthly sewer bill to $49.94, or about $599 annually. Odor-control measures are expected to be installed later this year to control the smell of waste, known for wafting over Santa Rita Park. Domes over basins where solid waste is separated from liquid waste will be installed during the last week of September, and carbon filters are scheduled to be installed in December, Boysen said. The reclamation of Santa Rita Park is expected to start after the new plant is complete in June 2019. Archer Western, the contractor building the plant, is expected to repair the park to preconstruction conditions or pay the city $80,000, Boysen said. It is likely that the area of the park disturbed by construction could be closed in 2019 and 2020 while reconstruction takes place, said Cathy Metz, Durango Parks and Recreation director. The undisturbed playground and river access will likely remain open. There are no parks and recreation funds in the budget for 2019 to rebuild the park, and city work on the park is likely to start in 2020, she said. The Parks and Recreation Advisory Board recently backed a plan for the park that could cost $5.7 million. Spending on the park would be phased in over time and includes the work Archer Western would pay for, she said. The city’s share of the project will be paid for by city sales taxes dedicated by voters for park projects, she said. The city has also applied for a $300,000 grant through the National Recreation and Park Association to offset the cost of redeveloping the park, she said. The plan anticipates volleyball courts, picnic shelters and basketball courts. The more expensive redevelopment option preferred by the advisory board would also move the Santa Rita parking lot away from the Animas River. The estimate also includes river take-out improvements that could cost $1.5 million. But that construction may not happen for several years, she said. It was never expected that work on the river take-out would happen while the reconstruction work on the park is taking place.